A math book full of informationsI love brocantes and vide-greniers, these sidewalk collective garage-sales that take place regularly in villages and towns all over France. Sellers are people like you and me who bring all the old stuff they want to get rid of to make a a few euros, and the organizers (usually a village or neighborhood group) usually ask a couple of euros par linear meter of sidewalk to display your attic troves. There's not only old stuff and the children initiate their business skills by selling their younger-age toys. There's nothing like strolling and finding things you never thought about in the first place. Just check this website to find one near where you are in France (this is the Paris page, but only change the digits at the end of the URL to find the departement you look for). The vide-greniers have multiplied to such an extent these last years that the French State/tax administration (I'm not making this up) tried to find a way, new rules, taxes or whatever to limit its success. Something that thrives under the tax radar is often suspect in France... It goes like (I'm afraid I'm 100% on target) : "look, Mr chief of cabinet of the Service des Impots (tax dept. ), something suspicious is going on here : brocantes and vide-greniers are all over the country and people are happily buying old junk from each other and we aren't making a centime of it !...we are being cheated and must act ! immédiatement !" A new law was thus quickly enacted, saying who could sell on these vide-greniers and who couldn't, which brought in return a salvo of resisting petitions. Whatever, either they backpedalled or the law isn't enforced, but these popular sidewalk sales managed somehow to survive, and it was in one of them in the Loire that I happened to have bought a school calculation book full of dictated math exercises painstakingly written and solved (or not soved) in the year of 1915. 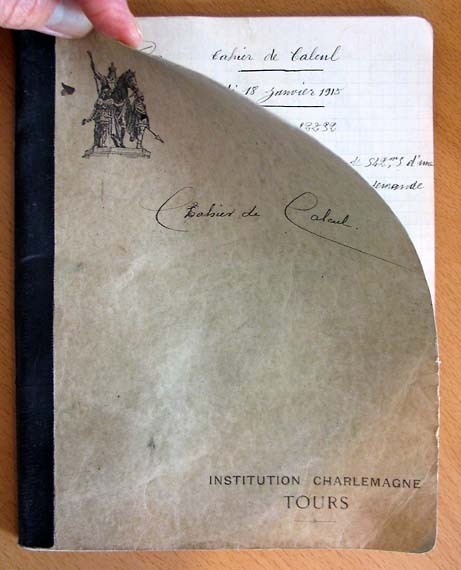 It belonged to a boy named Maurice Georges, pupil at the Institution Charlemagne in Tours (Loire), probably a private catholic school. I don't know why I bought this math exercise book, I leafed a bit through it, found that funny and as the seller wanted just 1 Euro for it, I took it. The math exercises are inspired from real-life situations like they used to do in school, you know, a merchant buys such and such, how much must he sell each item to make such amount of money, and so on. 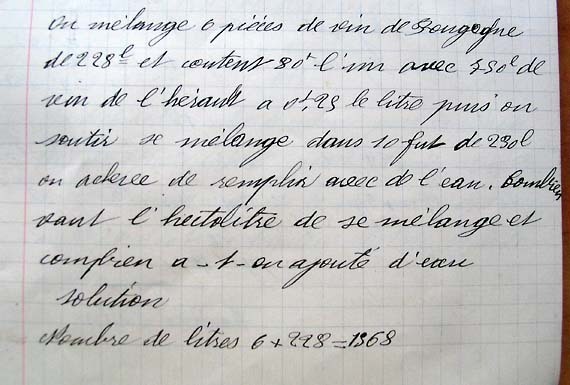 A dealer buys 7 casks of wine at 400 Francs per cask. To this wine, he adds 114 liters of water and sells the mix 1,7 Franc per 0,75 liter. 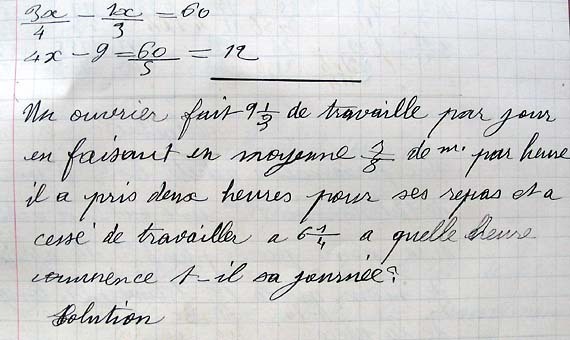 His net gain (bénéfice) is 447,20 Francs. What is the volume of each cask ? 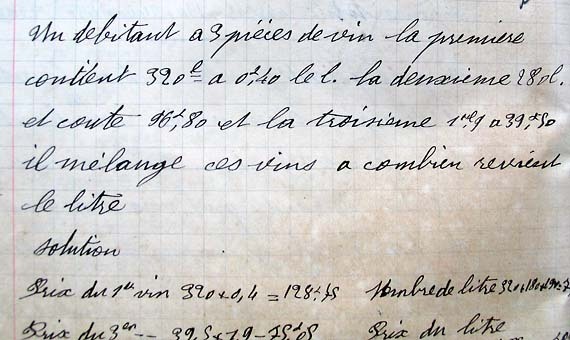 Number of liters in a cask : 1845 + 114/7 = 279,85 (or 280 liters). 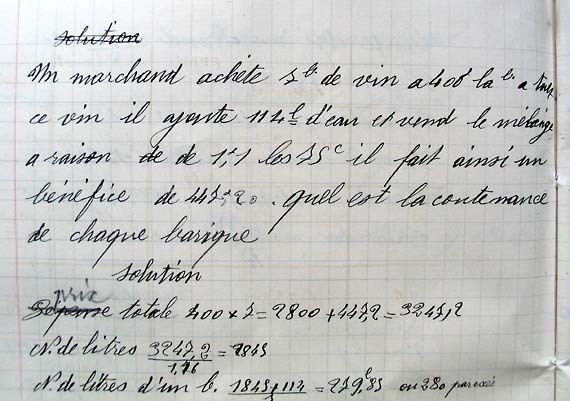 Some one mixes 6 casks (pièces) of Burgundy wine, each with a 228-liter volume and costing 80 Francs each [I'm buying that cask right away...], with 750 liters of Hérault [South of France] wine costing 0,25/liter. Then, this mix is racked into 10 casks with a capacity of 230 liters each. Water is added to complement the total volume. How much does an hectoliter of this final blend cost, and how much water was added ? 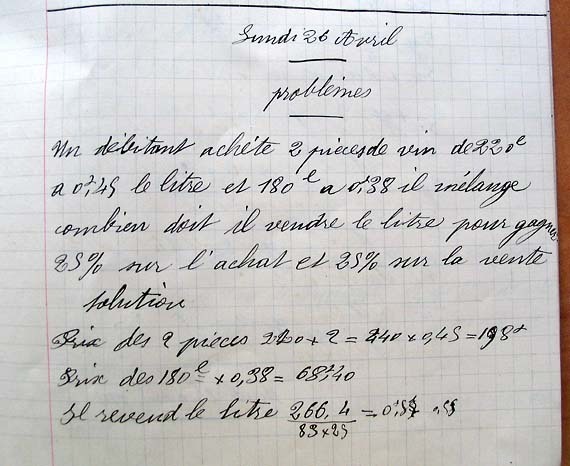 A débitant [probably a wine shop selling wine directly from the cask] buys two 220-liter casks of wine, at 0,45 Franc a liter, and another 180 liters of wine at 0,38 F a liter. He blends the wines. How much must he sell a liter of the resulting wine to earn 25% on the purchase and 25% on the sale. A débitant (caviste) has three casks of wine. The 1st contains 320 liters of wine at 0,4 Franc a liter. the 2nd, with a capacity of 228 liters, costs 98,80 Franc, and the 3rd has a 1,9-hectoliter capacity and costs 39,5 Franc. He blends these wines. What is the cost price of the resulting blend ? A vineyard with a surface of 1 hectare, 15 ares and 8 ca has been purchased for 0,6 Franc per square meter. It yielded 18 casks of wine with a capacity of 220 liters each. The wine was sold for 35 centimes a liter. 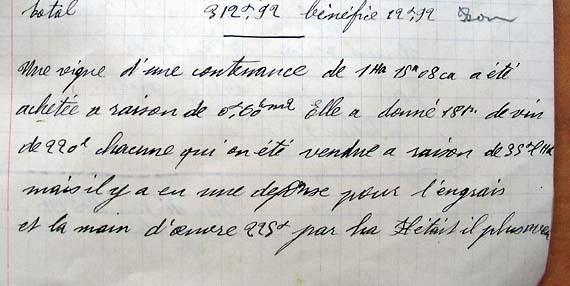 But their were additional expenses for fertilizers and manpower, amounting to 225 Francs per hectare. Would have it been more profitable to invest the money in a bank at a rate of 5% ? It is more profitable to take the vineyard (il est plus avantageux de prendre la vigne). Here, we learn the yields for this 1,15 hectare, which produced 3960 liters (18 casks/220 liters each). That's about 35 hectoliter/hectare, interesting because not too high, it could hint we have some possibility that this wine was good. Second, they already bought some sort of fertilizers then, but it is not clear if it was manure or some more serious stuff made by the industry. A worker works 9,5 hours per days. He works on average 7/8th of an hour [the boy's writing skills being far from perfect, I'm not sure of these last indications], he stopped two hours for his meals and finished work at 6:15am. At what time did he begin to work ? People were working a lot then, and had long pauses to eat. the text says "meals", so it could mean that they stopped twice at least to eat. There is one thing for sure, it is that workers drank a lot then, and I would bet that there was wine (mixed with water, of course) on the menu at each of their pauses. I am delighted to see that even French boys make grammatical and spelling mistakes when it comes to French, just like me. As for the math: I think that I, too, would have given up on trying to fathom some of those solutions.